1.) Melt the butter in a saucepan, then whisk in the flour to form a smooth paste. 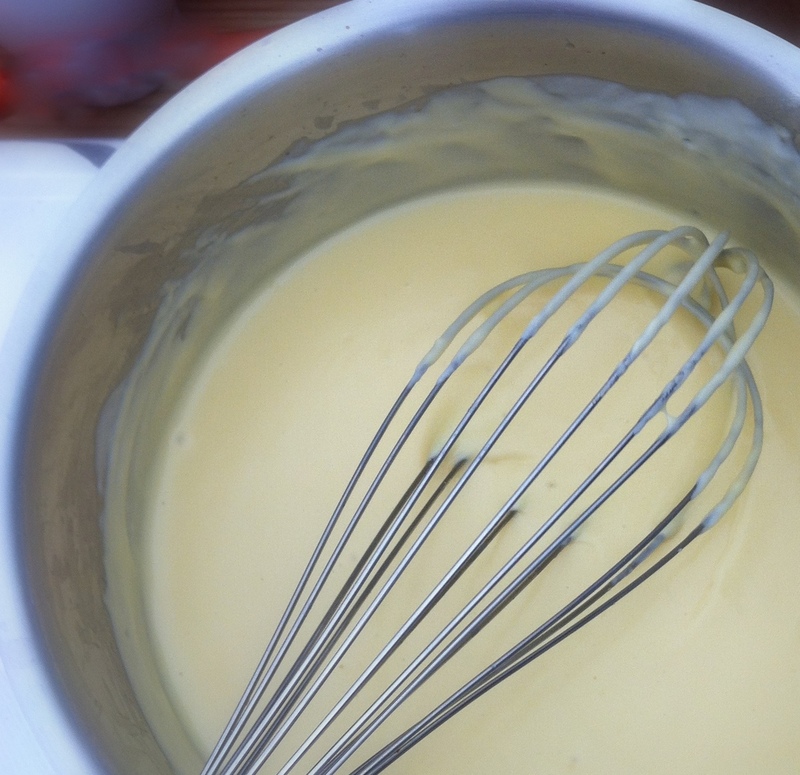 Allow the mixture to cook for a minute or two – this is known as a roux. 2.) Remove the pan from the heat, add a pinch of salt then gradually whisk in the milk until you have a smooth mixture. Return the pan to the heat and continue to whisk until the sauce has thickened, this should only take a couple of minutes. And that is it – easy peasy! This recipe is for a medium white sauce, for a thinner sauce use just 1 tablespoon each of butter and flour to 250ml milk. Don’t forget to check out some variations below. Choices, choices! Which sauce will it be today? 1.) Once the white sauce has thickened take it off the heat and stir in the grated cheddar cheese. A sharp cheddar works brilliantly. 2.) Keep stirring until the cheese has melted and you have a smooth sauce. Use to make make macaroni cheese or cauliflower bake, or spoon over baked potatoes. 1.) Heat a dash of olive oil in your saucepan and add the garlic and mushrooms (about 160g). Cook until the mushrooms are soft then take off the heat and set aside. 2.) Make your white sauce as normal and once thickened stir in the mushrooms and cook for a few minutes. Stir in the chopped parsley and season with salt and pepper to taste. Delicious on steak, burgers or chicken schnitzel. 1.) Make the white sauce as per the instructions above. Once thick, stir the parsley into the sauce. Check the seasoning and serve. Brilliant idea, it absolutely does! I often add mustard to the finished cheese sauce when making cauliflower / broccoli bake, it tastes amazing! You can also add a pinch of cayene pepper.